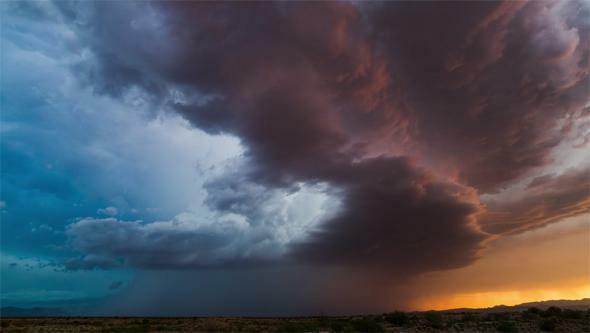 Monsoon II: Arizona storm time lapse. A mesocyclone forms over Arizona, turning the ruddy sky cerulean. Photo by Mike Olbinski, from the video. Via Jenny Winder on Facebook, I saw this absolutely stunning time-lapse video of storms over Arizona taken by photographer Mike Olbinski. Yegads. These storms were shot over the summer of 2015. Arizona may not be known for its total rainfall, but what it does get it gets in very short and serious bursts. It’s amazing to see the powerful convection currents blasting upward (look for cap-shaped pileus cloud sheets above the cumulonimbus cells; especially at 1:23), remembering that you’re seeing millions of tons of water being casually, if violently, moved around. Several of the rain downpours look to be microbursts, huge but constrained downward bursts of colder air caused by water evaporating. Interestingly, I wrote about one that occurred in Arizona in August of 2015; I wonder if that one was caught by Olbinski as well. If you doubt their power, a microburst over Montana in 1999 blew down trees like matchsticks. My favorite part is the mesocyclone that sweeps past at 3:23. The blue-green color on the upwind side—the source of which is still not completely understood—contrasts with the red glow to the right, and it’s simply breathtaking. I am also impressed (as I usually am with time-lapse animations) with the choice of music: “Palladio (Rebuilt)” by Kerry Muzzey. It builds anticipation and suspense, with Olbinski carefully timing segments to match it. Wonderful. With an El Niño as powerful as the one we’re experiencing now, I can hope to see some spring and summer storm activity over my own home of Colorado. We do get them, and seeing this video only makes me want to experience them more.